Hattie Olga Bagwell was born on 26 February 1888. She was the daughter of Andrew Jackson Bagwell Jr. and Emma Harriett Gentry. Hattie Olga Bagwell died on 8 July 1889 at age 1. She was buried at Pleasant Grove Cemetery, Choudrant, Lincoln Parish, Louisiana. Married first to Ethel May Ramsey ( June 3, 1909 ) had a son Horace Vernon Bagwell. Second marriage to Sadie Wymore, 2 children. GROVER CITY- almost 300 persons paid their last respects to Horace Virgil Bagwell 68, at funeral services at 10 am. yesterday in the First Southern Baptist Church, with Rev. W. C. Meacham officiating. Bagwell died suddenly of a heart attack Saturday afternoon in Ruston, La. while he and Mrs. Bagwell were visiting friends and relatives in his boyhood town. He had been a resident of Grover City since 1937, moving here from Los Angeles where he had been identified with the real estate business and the development of such areas as Culver City over a period of 15 years. Soon after coming here he acquired considerable land on former ranch property, now known as Grover City, which he founded and developed. The radio and newspaper campaigns he waged unceasingly to attract low-income people to the area he called "Rainbow's End" are still talked about by his friends. Bagwell has always been a civic leader in the community. He was founder and president of the Grover City Development Co; the fourth honorary mayor of Grover City in 1957; founder of the Grover City Youth Foundation, a charter member of the Los Angeles Realty Board, a member of the Arroyo Grande Rotary Club, the Grover City Civic Association, the Grange, Moose Lodge of Pismo Beach, and the Baptist Church. For the past 2 years he was inactive in his real estate business, due to illness leaving business affairs to his son, Charles, vice-president of the firm. While never directly active in politics, his advice was often sought by county and state officials interested in this area. 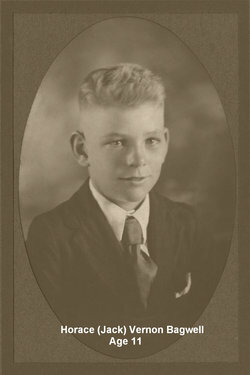 He is survived by his widow, Sadie, Grover City; 2 sons, Charles, Grover City and Jack Bagwell, Albuquerque, N.M; 2 daughters, Betty Jane Moore, San Gabriel, and Lillian Sambrook, Los Angeles; 2 brothers, V. Jack Bagwell, West Monroe, La. and W. M. Bagwell, Choudrant, La; 2 sisters, Lillian Land, Ruston, La., and Emma Thompson, Shreveport, La; and 8 grandchildren. [S826] Email from Christie Bagwell Stewart dated May 20, 2009 to Hunter Bagwell; Subject Line: Re: Horace Virgil Bagwell. [S880] Horrice Virgil Bagwell Grave Stone, Find a Grave, www.findagrave.com. [S635] Horace Vernon (Jack) Bagwell Grave Stone, Find a Grave, www.findagrave.com. Clara May Bagwell was born on 3 November 1891 in Choudrant, Lincoln Parish, Louisiana. She was the daughter of Andrew Jackson Bagwell Jr. and Emma Harriett Gentry. Clara May Bagwell died on 4 October 1914 in Lincoln Parish, Louisiana, at age 22. She was buried at Choudrant Cemetery, Choudrant, Lincoln Parish, Louisiana. Ivy Lee Bagwell was born on 23 January 1894 in Louisiana.1 He was the son of Andrew Jackson Bagwell Jr. and Emma Harriett Gentry. Ivy Lee Bagwell married Eula B. Hadley before 1930. 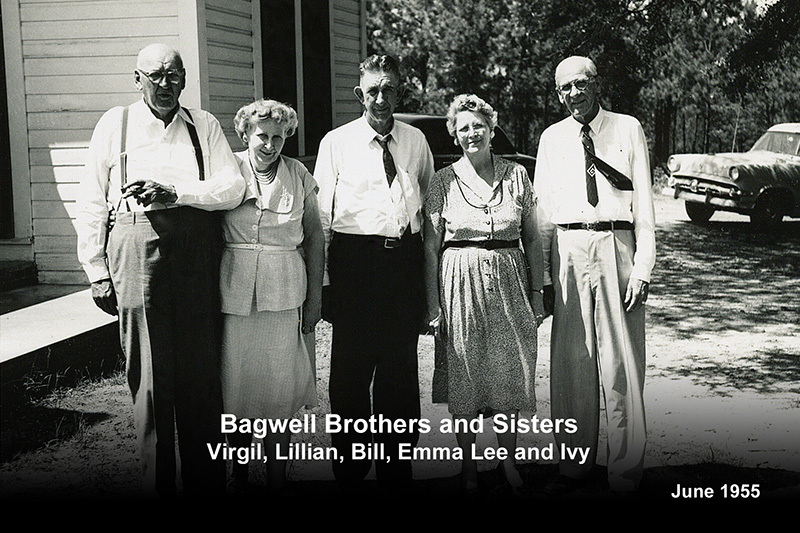 Ivy Lee Bagwell and Eula B. Hadley lived in 1940 in Los Angeles, Los Angeles County, California. Ivy Lee Bagwell died on 29 May 1958 at age 64 Funeral services for I. L. Bagwell, 64, a Valley realtor for 20 years, were conducted yesterday at 3 p.m. (May 31, 1958) from Hollywood Hills, Forest Lawn. Dr. Scott Brewer, pastor of Encino Presbyterian Church, officiated. Masonic services were conducted at the grave in Hollywood Hills. Mr. Bagwell, who had been ill for the past six weeks, died Thursday (May 29, 1958) in Good Samaritan Hospital after undergoing chest surgery the day before. His widow, Eula, was president of the Encino Woman's Club this past year. Their home is at 17038 Rancho St., Encino. A native of Louisiana, Mr. Bagwell came to California 24 years prior to joining Exhibit Homes, whose offices are in Beverly Hills. The firm has building developments in the Valley. Mr. Bagwell was a 32nd degree Mason and a member of Al Malaikah Temple of the Shrine. He had been active in the management of the Encino Community Center and in its youth activities. He also was active in the Encino Chamber of commerce and had served as chairman of its streets and highways committee of several years. He also worked in the West Valley associated Chambers of Commerce. In addition to his widow, he is survived by three brothers, Horace of Grover City, Ca., William M., of Choudrant, La; Vollie, of Monroe, La; and two sisters, Mrs. Oliver Thompson, Shreveport, La., and Mrs. Otho Land, Rustin, La. William Mallory Bagwell, aka "Big Bill"
William Mallory Bagwell was also known as William Mallary Bagwell.1 William Mallory Bagwell was also known as Big Bill Bagwell. He was born on 24 February 1895 in Choudrant, Lincoln Parish, Louisiana.1 He was the son of Andrew Jackson Bagwell Jr. and Emma Harriett Gentry. William Mallory Bagwell married Carrie Velma O'Neal after 1910.2 Bagwell was born in Choudrant, Louisiana, in 1895. He started his professional baseball career in 1920 in the Louisiana State League. That season, he had a .344 batting average in 33 games. Bagwell then spent two years in the Southwestern League. In 1921, he batted .357, and in 1922, he batted .402 and led the league in batting average, hits (217), and total bases (323). In October 1922, Bagwell was drafted by the Boston Braves in the rule 5 draft. He played for both the Braves and the Eastern League's Worcester Panthers in 1923. With Boston, he batted .290 in 56 games; with Worcester, he batted .453 in 49 games to lead the Eastern League in batting average. The Braves released Bagwell in April 1924. 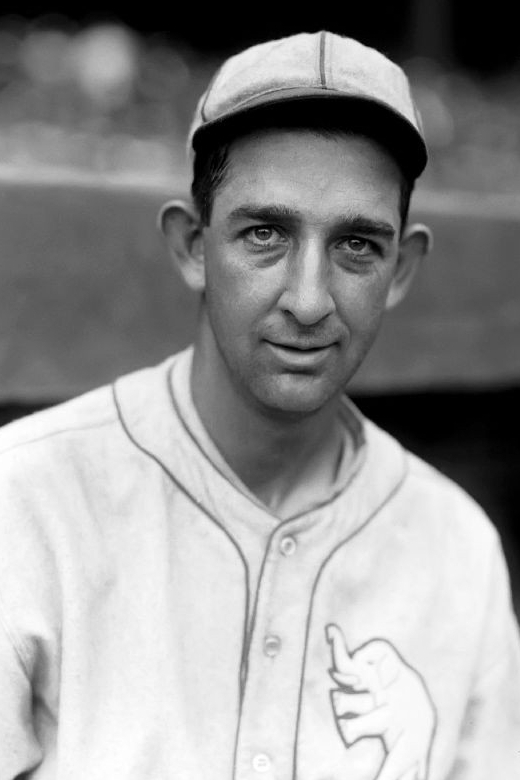 He spent one season in the Texas League, batted .367 with a career-high 37 home runs there, and then returned to the majors in 1925 with the Philadelphia Athletics. Bagwell spent nearly the whole season as a pinch hitter for Philadelphia. He appeared in 36 games and went 15 for 50 (.300) at the plate. In 1926, Bagwell played for the Pacific Coast League's Portland Beavers. He batted .391 to lead his league in batting average for the third time. In 1927, however, Bagwell's average fell to .292 for Portland. He bounced around various minor leagues for the next few years before retiring from professional baseball after the 1930 season. In his 11-year career, Bagwell hit .294 in the major leagues and .360 in the minor leagues. He died in Choudrant, Louisiana, in 1976. He played left field and batted and threw left-handed. The Boston Braves was one of the National League's two remaining charter franchises (the other being the Chicago Cubs), the club was founded in Boston, Massachusetts in 1871 as the Boston Red Stockings (not to be confused with the American League's Boston Red Sox or the NL Central's Cincinnati Reds). The team moved to Milwaukee, Wisconsin in 1953 and became the Milwaukee Braves. In 1966, the team moved to Atlanta. The team's tenure in Atlanta is famous for Hank Aaron's breaking of the career home run record in 1974; the new record stood until 2007. [S808] William Mallary (Bill) Bagwell Grave Stone, Find a Grave, www.findagrave.com. [S809] Carrie Velma O'Neal Bagwell Grave Stone, Find a Grave, www.findagrave.com. Lillian Luseal Bagwell was born on 16 October 1896. She was the daughter of Andrew Jackson Bagwell Jr. and Emma Harriett Gentry. As of after 1910,her married name was Land. Lillian Luseal Bagwell married Otho Harrison Land after 1910. Lillian Luseal Bagwell died on 27 August 1974 in Ruston, Lincoln Parish, Louisiana, at age 77. She was buried at Greenwood Cemetery, Ruston, Lincoln Parish, Louisiana. Ollie Viola Bagwell was born on 6 February 1900 in Choudrant, Lincoln Parish, Louisiana. She was the daughter of Andrew Jackson Bagwell Jr. and Emma Harriett Gentry. As of after 1915,her married name was Kelly. Ollie Viola Bagwell married James Henry Kelly after 1915. Ollie Viola Bagwell died on 11 August 1929 in Shreveport, Caddo Parish, Louisiana, at age 29 Ollie Viola (Bagwell) Kelly was born Feb. 6, 1900 in Choudrant, Lincoln Parish, La., one of eleven children born to Andrew Jackson Bagwell and Emma Harriet Gentry. Viola (she was called by her middle name) grew up in Choudrant and graduated from Choudrant High school about 1918 as the valedictorian of her class. She married James Henry Kelly, also of Lincoln Parish, La., about 1919. A short time after their marriage, they moved to Shreveport, La. James and Viola had two children: James Henry Kelly, Jr., born Nov. 11, 1922, and Melrose Kelly, born Feb. 15, 1926. At the young age of 29, Viola became ill and died Aug. 11, 1929, leaving the two children, James Jr., age six, and Melrose, age three. Viola was buried in Forest Park Cemetery East, Shreveport, La. Prior to the birth of James, Jr., Viola's sister, Emma Lee Bagwell, moved to Shreveport to assist with Viola's first baby. Emma Lee lived with James and Viola. After Viola died, Emma Lee continued to live in the house to assist James with the children. Emma Lee was married March 22, 1930 to Oliver Thompson. She and Oliver lived with James and his two children for a short time, before moving to an apartment. She was buried at Forest Park East Cemetery, Shreveport, Caddo Parish, Louisiana. Infant Bagwell died on 26 December 1902. She was born on 26 December 1902. She was the daughter of Andrew Jackson Bagwell Jr. and Emma Harriett Gentry. Infant Bagwell was buried at Pleasant Grove Cemetery, Choudrant, Lincoln Parish, Louisiana. [S764] Vollie L. (Jack) Bagwell Grave Stone, Find a Grave, www.findagrave.com. [S765] Eunice Rush Bagwell Grave Stone, Find a Grave, www.findagrave.com. [S766] Gloria Jane Bagwell Grave Stone, Find a Grave, www.findagrave.com. Ethel May Ramsey was born on 31 December 1887 in Mt. Pleasant, Henry County, Iowa. As of 16 July 1904,her married name was Grimshaw. She married Arthur Erwin Grimshaw on 16 July 1904. As of 2 June 1909,her married name was Bagwell. Ethel May Ramsey married Horace Virgil Bagwell, son of Andrew Jackson Bagwell Jr. and Emma Harriett Gentry, on 2 June 1909.1 As of after 1913,her married name was Richeson. 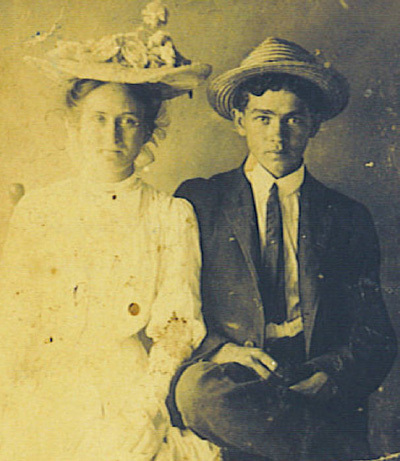 Ethel May Ramsey married Claud R. Richeson after 1913. As of after 1950,her married name was Haft. Ethel May Ramsey married Homer C. Haft after 1950. Ethel May Ramsey died on 16 January 1967 in Albuquerque, Bernalillo County, New Mexico, at age 79. She was buried at Sandia Memory Gardens, Albuquerque, Bernalillo County, New Mexico. Horace Vernon Bagwell was also known as Jack Bagwell.2 He was born on 1 July 1911 in Coyle, Logan County, Oklahoma.1 He was the son of Horace Virgil Bagwell and Ethel May Ramsey.2,1 Horace Vernon Bagwell married Mary Bell Owens on 15 February 1930 at Tulsa, Tulsa County, Oklahoma.1 Horace Vernon Bagwell and Mary Bell Owens were divorced on 6 February 1936.1 Horace Vernon Bagwell married Gertrude (Trudy) Ogan on 12 February 1937.1 Horace Vernon Bagwell and Gertrude (Trudy) Ogan were divorced in May 1941.1 Horace Vernon Bagwell married Mabel Christine Stevenson on 4 May 1942 at Alburquerque, New Mexico. Horace Vernon Bagwell married Elva Pauline Dillard Mayes on 30 November 1944 at Fort Custer, Augusta, Kalamazoo County, Michigan. Horace Vernon Bagwell married Retha Jones LeFore on 14 July 1945 at Dallas, Dallas County, Texas. Horace Vernon Bagwell married Bertha Alice Maines on 19 March 1967 at Yoder, Clackamas County, Oregon. Horace Vernon Bagwell died on 8 August 1967 in Molalla, Clackamas County, Oregon, at age 56.1 He was buried at Smyrna Cemetery, Canby, Clackamas County, Oregon. Betty Jane Bagwell was born on 7 October 1924 in California. She was the daughter of Horace Virgil Bagwell and Sarah (Sadie) Lucinda Wymore.1 Betty Jane Bagwell died on 27 September 2014 in California at age 89. She was buried at Arroyo Grande Cemetery, Arroyo Grande, San Luis Obispo County, California. Charles Lee "Charlie" Bagwell, 73, a lifelong resident of Grover Beach, died Tuesday, June 4, 2002, at a San Luis Obispo hospital. Visitation will be held from 4 to 7 p.m. today at Marshall-Spoo Sunset Funeral Chapel in Grover Beach. A memorial service will be held at 11 a.m. Friday, also at Marshall-Spoo Sunset Funeral Chapel. It is requested that attendees wear golf attire and bring a signed golf ball. Mr. Bagwell was born July 31, 1928. He attended Arroyo Grande High School and San Luis Obispo Junior College. He then attended real estate school in Los Angeles. He served in the U.S. Merchant Marine from 1944 to 1946. He was a member of the Oceano Elks Lodge No. 2504 and the Moose Lodge No. 1409 in Pismo Beach. He was past president of the South County Kiwanis Club, past member of the Pismo Beach Lions Club, and past trustee for the Pismo Beach School Board. Mr. Bagwell served as a city councilman for eight years and as mayor of Grover Beach for six years. He enjoyed fishing and golfing. Mr. Bagwell is survived by his children, Carol Occhuizzo of Indiana, Pa., Karen Tomberlan of Susanville and Denise Scallberger of Sacramento; grandchildren, Michael Occhuizzo of Pittsburgh, Pa., Matthew Occhuizzo of Indiana, Pa., and Ryan Tomberlan of Westwood; sister Bettie Moore of Los Angeles; and nephews, Michael Moore of Colorado and Ron Moore of Los Angeles. Memorial contributions may be made to the City of Hope, Attention Treasury Department, 1500 E. Duarte Road, Duarte, CA 91010. Margaret Ann Bagwell was born on 21 August 1932 in Los Angeles County, California.1 She was the daughter of Horace Vernon Bagwell and Mary Bell Owens.1 As of after 1948,her married name was Smith. Margaret Ann Bagwell married Price Layton Smith after 1948. Margaret Ann Bagwell died on 3 September 2004 in Georgia at age 72.1 She was buried at Fullerton Memorial Gardens, Jasper County, Georgia. James Lynn Bagwell, 73, of Hamilton passed into the arms of Jesus Monday, March 24, 2014 in Waco, TX., with family at his side. He made a last minute decision to donate his body to science in hope that it may be used to save lives, especially those with heart disease. His family was honored to grant his last wish. A family memorial will be held on the Brazos River at a later date. He was born July 18, 1940 to Horace Vernon Bagwell and Gertrude Ogan in Granbury, TX. On Christmas day 1959 he married the love of his life Sharon Lee Clanton, a loving and blessed marriage of 54 years. James and Sharon owned and operated Bagwell Meat's in Rendon and Hamilton and Bagwell's Deer Processing in Hamilton, working side by side until retiring in 2004. He was a loving and devoted husband, dad and Papaw who loved nothing more than his family. A true man of his word, hard worker and great provider. He enjoyed hunting, fishing, air boating down the Brazos River and watching his grandsons play ball. He was preceded in death by his parents; son, Jeffrey Lynn Bagwell 2013 and great-grandson, Cason Branham Piepkorn 2010. Survivors include his wife Sharon; daughter Christie Stewart and husband Greg , son Cody Bagwell and wife Kiesha; grandchildren, Heather Shull and husband Ryan, Clay and Tyler Stewart, Brittaney Boatwright and husband Clay, Blake Whitehead, Casey Bagwell, Payton and Caden Bagwell; great grandchildren, Baily and Bethany Boatwright, and Cutter Shull. Brothers Robert Bagwell and wife Linda, Gene Massengale and wife Nancy. Several nieces and nephews. The family would like to thank the Doctors and nurses at Hamilton Hospital, Providence Hospital and Hospice. The care and compassion we received was excellent. Sharon Lee Clanton married James Lynn Bagwell, son of Horace Vernon Bagwell and Gertrude (Trudy) Ogan, on 25 December 1959. Christie Lynn Bagwell is the daughter of James Lynn Bagwell and Sharon Lee Clanton. Christie Lynn Bagwell married Greg Stewart after 1980. Jeffery Lynn Bagwell was born on 25 February 1966 in Fort Worth, Texas. He was the son of James Lynn Bagwell and Sharon Lee Clanton. Jeffery Lynn Bagwell married (?) Unknown on 2 February 1985 at Hamilton County, Texas. Jeffery Lynn Bagwell and (?) Unknown were divorced on 14 June 1988 at Hamilton County, Texas. Jeffery Lynn Bagwell married (?) Unknown on 2 July 1993 at Hamilton County, Texas. Jeffery Lynn Bagwell and (?) Unknown were divorced on 10 May 1996 at Hamilton County, Texas. Jeffery Lynn Bagwell died on 23 January 2013 in Beaumont, Jefferson County, Texas, at age 46. Cody Lynn Bagwell is the son of James Lynn Bagwell and Sharon Lee Clanton. Cody Lynn Bagwell married Kiesha (?) after 1990. Debbie Phillips married John Jay "Johnny" Frezell, son of Wilfred Leo Sutton (John) Frezell and Frankie Mignon Manown, on 30 May 2000. James Marion Browning was born on 27 November 1835 in Anderson County, South Carolina.1 He married Diza Pritchett circa 1860 at Georgia. CSA, CO-D 43rd Regiment, GA Volunteer Infantry Army of Tennessee. Middle River Volunteers. Fought on 29 Apr 1862 at Bridgeport, AL. Fought on 15 Jun 1862 at Chattanooga, TN. Fought on 22 Jul 1862 at Atlanta, GA. Fought on 4 Sep 1862 at KY. Fought on 8 Sep 1862 at KY. Fought on 20 Sep 1862. Fought on 10 Oct 1862 at Harrodsburg, KY. Fought on 15 Oct 1862 at Bourbon County, KY. Fought on 26 Oct 1862 at Lexington, KY. Fought on 29 Dec 1862 at Chickasaw Bayou, MS. Fought on 9 Apr 1863 at Vicksburg, MS. Fought on 4 May 1863 at Vicksburg, MS. Fought on 16 May 1863 at Baker's Creek, MS. Fought on 17 May 1863 at Baker's Creek, MS. Fought on 18 May 1863 at Baker's Creek, MS. Fought on 25 May 1863 at Vicksburg, MS. Fought on 26 May 1863 at Vicksburg, MS. Fought on 16 Jun 1863 at Vicksburg, MS. Fought on 21 Jun 1863 at Warren, MS. Fought on 3 Jul 1863 at Vicksburg, MS. Fought on 4 Jul 1863 at Vicksburg, MS. Fought on 3 Nov 1863 at Centreville, TN. Fought on 15 Nov 1863. Fought on 28 Nov 1863 at Graysville, GA. Fought on 28 Nov 1863 at Chattanooga, TN. Fought on 15 Feb 1864. Fought on 25 Feb 1864 at New Hope Church, GA. Fought on 27 Feb 1864 at Atlanta, GA. Fought on 29 Feb 1864. Fought on 12 May 1864 at Dalton, GA. Fought on 19 May 1864 at Kingston, GA. Fought on 20 May 1864 at Cassville, GA. Fought on 25 May 1864 at Resaca, GA. Fought on 25 May 1864 at New Hope Church, GA. Fought on 29 May 1864 at Allatoona Line, GA. Fought on 1 Jun 1864 at Dallas, GA. Fought on 13 Jun 1864 at Cherokee County, GA. Fought on 14 Jun 1864 at Resaca, GA. Fought on 19 Jun 1864 at Kenesaw Mountain, GA. Fought on 27 Jun 1864 at Kenesaw Mountain, GA. Fought on 3 Jul 1864 at Forsyth County, GA. Fought on 4 Jul 1864 at Marietta, GA. Fought on 5 Jul 1864 at Nickajack, GA. Fought on 5 Jul 1864 at Nickajack Creek, GA. Fought on 7 Jul 1864 at Chattahoochee River, GA. Fought on 21 Jul 1864 at Decatur, GA. Fought on 21 Jul 1864 at Atlanta, GA. Fought on 24 Jul 1864 at East Point, GA. Fought on 27 Jul 1864 at Kenesaw Mountain, GA. Fought on 7 Aug 1864 at Jonesboro, GA. Fought on 9 Aug 1864 at Atlanta, GA. Fought on 13 Aug 1864 at Atlanta, GA. Fought on 15 Aug 1864 at GA. Fought on 15 Aug 1864. Fought on 31 Aug 1864 at Rough & Ready, GA. Fought on 17 Sep 1864 at Atlanta, GA. Fought on 28 Oct 1864 at Morristown, TN. Fought on 14 Dec 1864 at Nashville, TN. Fought on 14 Dec 1864 at Bristol, TN. Fought on 22 Dec 1864 at Columbia, TN. Fought on 10 Feb 1865 at Edisto River, SC. Fought on 12 Feb 1865 at Orangeburg, SC. Fought on 18 Feb 1865 at Columbia, SC. Fought on 20 Feb 1865. Fought on 10 Mar 1865 at Kinston, NC. Fought on 14 Mar 1865 at Kinston, NC. Fought on 18 Mar 1865 at Bentonville, NC. Fought on 13 Apr 1865 at Raleigh, NC, Hospital. Fought on 13 Apr 1865. Fought on 15 Apr 1865 at Macon, GA. Fought on 8 May 1865 at Athens, GA. Fought on 17 May 1865 at Hartwell, GA. Fought on 18 May 1865 at Hartwell, GA.
[S532] James Marion Browning Grave Stone, Find a Grave, www.findagrave.com. [S533] Missouri Elvira Lyles Browning Grave Stone, Find a Grave, www.findagrave.com. Wedding day for Crowell Justin Browning and Ammarilla (Rilla) Bagwell circa 1911. [S537] Crowell Justin Browning Grave Stone, Find a Grave, www.findagrave.com. Her married name was Browning. Diza Pritchett was born in 1843 in Banks County, Georgia. She married James Marion Browning circa 1860 at Georgia. Diza Pritchett died in 1877 in Georgia. Missouri Elvira Lyles was born on 15 July 1868 in South Carolina.1 She was the third wife of James Marion Browning. They married July 5, 1885 in Franklin Co, GA. According to family legend, Missouri was half Cherokee Indian. They lived on Smithtown Road in Suwanee when this photo was made. Notice the rocks at the front of the porch. Her grandson, Ralph Browning, remembers as a boy falling on those very rocks and breaking his nose. She was the daughter of William A Lyles and Nancy M Stowe Lyles. She was the mother of Charles Wesley, Lilly Pearl, James Ellis, Crowell Justin, and Jasper Marshall Browning. Emma McKee was born in 1850. As of 5 September 1880,her married name was Browning. She married James Marion Browning on 5 September 1880 at Franklin County, Georgia. Charles Wesley Browning was born on 17 February 1887 in Gwinnett County, Georgia. He was the son of James Marion Browning and Missouri Elvira Lyles. Charles Wesley Browning died on 16 September 1965 in Canton, Cherokee County, Georgia, at age 78. Lilly Pearl Browning was born on 11 June 1888 in Gwinnett County, Georgia. She was the daughter of James Marion Browning and Missouri Elvira Lyles. Lilly Pearl Browning died on 4 April 1909 at age 20.